Shops : YES, Le Boulevard. Restaurants : Eiffel Tower Restaurant,Les Artistes Steakhouse, Lenôtre, Le Provençal, Mon Ami Gabi, Le Village Buffet, Le Café Île St. Louis, JJ's Boulangerie, Ortanique, Ah Sin, La Creperie, du Parc. Standard room amenities : Cable TV, PPV movies, hair dryer, AC, Coffee maker, iron, telephone with voice mail. Hotel amenities : Concierge, car rental, laundry service, luggage service, maid service, currency exchange, safe deposit box, wake-up call. 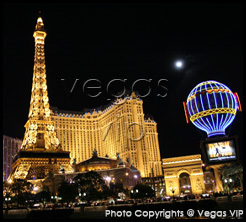 Complete with an outdoor sky on the ceilings of its casino and a fresh smell in the air, the famous hotel resembling The City of Light is a favorite among visitors to Las Vegas. Do not forget also, the Eiffel Tower and Arc de Triomphe replicas are set on the premises. Guest rooms are spacious and beautifully appointed, and the list of amenities includes dual-line phones, data ports, full-length mirrors and more. Also check out Chateau, the nightclub, lounges, a sports book and luxurious convention areas. 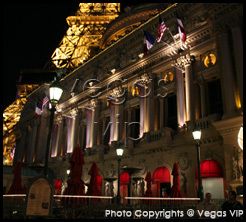 Paris Las Vegas has the sexiest wedding chapel, it is afordable and has very good review. If you are getting married you should consider having your ceremony here, you can also refresh your mariiage at the Paris. 4.0 on Dec 21, review by T.A.